Breckenridge Material, Eastern Missouri Concrete and CarbonCure remove barriers to building greener in the St. Louis Area. St. Louis - Breckenridge Material Company has been pushing the boundaries of local ready mix concrete technology adoption since 1925. They have done it yet again by announcing that they have joined the 80+ concrete producers who are using CarbonCure’s technology to lower operational costs while economically providing an environmental friendly construction solutions to the Greater St. Louis area. Through a new partnership with CarbonCure Technologies, Breckenridge Material Company and (EMC) now recycle waste carbon dioxide (CO2) into concrete to increase its environmental, material, and economic performance. Not only is the CO2 permanently converted into a solid mineral within the concrete, but the addition of CO2 also improves the compressive strength of concrete. Breckenridge Material Company has passed through the family for four generations. The company was originally founded by Nathan McKean’s great uncle, Frank Breckenridge and was acquired by his brother-in-law (McKean’s grandfather) shortly after Breckenridge’s death following WWII. 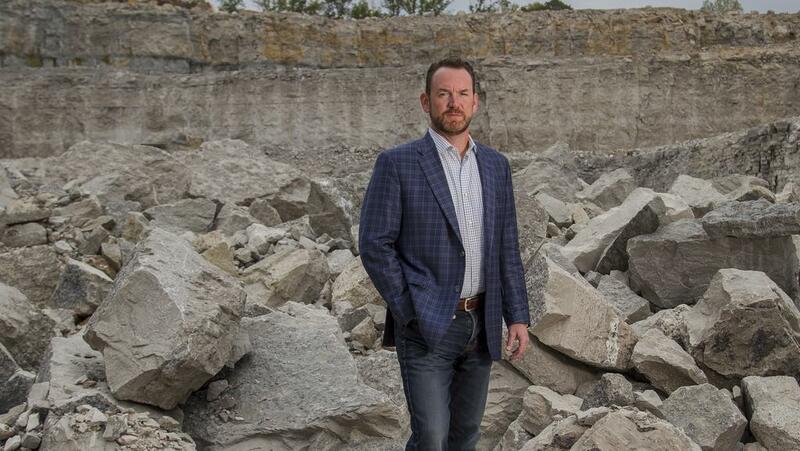 When Nathan’s father was leading the company, he was the first in the region to start using Class C fly ash and got it approved by the Department of Transportation (DOT). 25 years later, Nathan was the first in the region to utilize ground granulated blast furnace slag in concrete production which was also ultimately approved by the DOT. Since the age of 12, McKean has been involved in every job imaginable in the organization. When McKean took over as CEO of Breckenridge, he engaged in an aggressive series of mergers and acquisitions where the organization sought to purchase other businesses to expand their geographical reach. He also diversified by purchasing companies up the construction material supply chain by acquiring several aggregate mining operations. McKean’s business sense has led the organization to quadruple in size, and reach a revenue of over $100M by 2016. Now, with CarbonCure, they seek to increase their share of the growing green building market in the St. Louis area. CarbonCure’s technology can affordably reduce the embodied carbon footprint of concrete. This year Breckenridge could reduce CO2 by as much as 1000 tonnes of CO2, which is equivalent to the amount of carbon absorbed by 1200 acres of US forest in a year – which is a forest twice the size of downtown St. Louis. CarbonCure’s retrofit technology chemically sequesters waste carbon dioxide during the concrete manufacturing process to make greener and stronger concrete. CarbonCure’s technology is now being used to reduce concrete’s environmental footprint and provide production cost savings for more than 80 concrete producers across North America. CarbonCure is part of a growing industry of CO2-utilization technologies that are expected to reduce global greenhouse gas emissions by 15% by 2030. CarbonCure’s technology is currently operational in a growing number of concrete plants across North America, including several of the world’s largest vertically-integrated cement and concrete companies. CarbonCure is one of 23 semi-finalists in the $20 million NRG COSIA Carbon XPRIZE challenge, which has been called the Nobel prize for climate technologies. For more information, contact info@carboncure.com or visit carboncure.com.